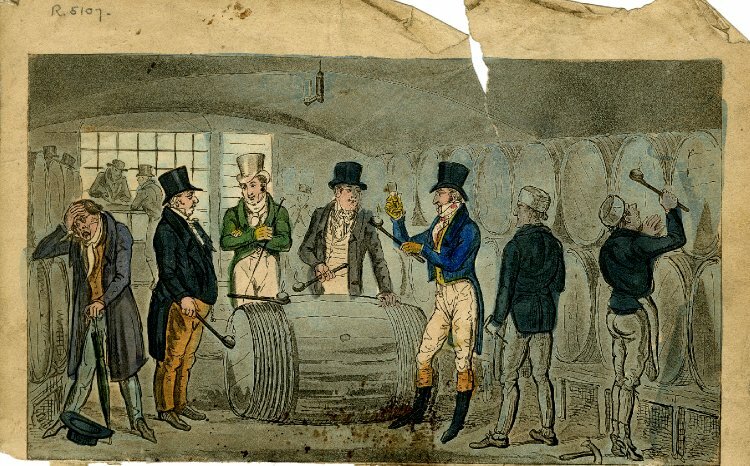 “LOGIC, who was a dear lover of wine, tasted, tasted, and tasted so often, that he ultimately became non compos mentis, and required the assistance of a drag to convey him home to the Albany.” From Pierce Egan Life in London (1821). Tom, Jerry and Logic, “tasting” Wine in the Wood, at the London Docks. 1821. George Cruikshank. The British Museum. This blog features over 2,000 posts filled with tasting notes, research, and historic images. Due to the chronological nature of this blog and the developing need for recategorization, it is inevitable that posts, in effect, have become lost. To combat such loss I already maintain a page dedicated to annotated descriptions of my history of wine posts. A good portion of this blog contains tasting notes from which a smaller proportion are about the more interesting bottles I have drunk. Therefore, with a strong nod towards age, these interesting posts are tagged as Rare Wine, Fine Wine, Mature Wine, and Old Wine. This page will automatically display the 100 most recent of these posts.